We’ve had quite a bit of interest in our ‘example’ data models from ERPs over the last few months. A number of people have said that they don’t have a modelling tool easily accessible and therefore can’t see what the diagrams look like, which is a fair point. With that in mind, you will see two images here, one of a JDEdwards Accounts Payable system as a PowerDesigner Data Model, the other a set of Salesforce tables as an ERwin data model. These give an idea of the kind of Entity-Relationships models that can be made with Safyr, based upon metadata drawn from the respective application. The first data model we did in this series was a SAP ‘Bill of Materials’ model – so you might ask why that’s not here as an image too? Short answer is that it’s too large to show easily in a single picture. In my view it also provides evidence of the need for tools which allow the user to quickly locate the tables they need in the context of their project because trying to visualize an entire JD Edwards, Salesforce or for that matter SAP data model is totally impractical. I have been reading quite a lot recently about the applicability of Agile methodologies for Data Warehousing amongst other initiatives and it appears to me that often the topic of source data analysis is under-represented in the literature and blogs. In the Agile Manifesto (http://agilemanifesto.org) published in 2001, much is made of the need for delivering solutions which satisfy the business user (customer) in a timely way, incorporating change, frequent delivery, collaboration between the business and IT and much more. In an excellent piece written by Kent Graziano (Data Warrior LLC, http://kentgraziano.com/) for Oracle Scene recently, he reflects on the 12 specific principles of the Agile Manifesto in the context of making delivery of Data Warehouses faster and more effective. However in amongst the discussion about data modelling for a data warehouse, possibly using the Data Vault method, changes to ETL coding and the warehouse itself due to requirement changes there is little attention paid to the originating applications which provide the raw data for the warehouse itself. In an Agile world it is important to be able to deliver small and often, to be able to cater for changes due to user needs, business imperatives and regulatory requirements. Using approaches such as Data Vault and modern model driven data warehouse design solutions (such as that provided by BiReady) and ETL tools the IT department or project team has a good chance of succeeding in delivering effective sources for BI, Data Discovery and Analytics tools. In an Agile world I would maintain that it is also critical to have a way to understand the data models (metadata) which underpin the ‘systems of record’ from which a great deal of the data for the Data Warehouse is extracted. 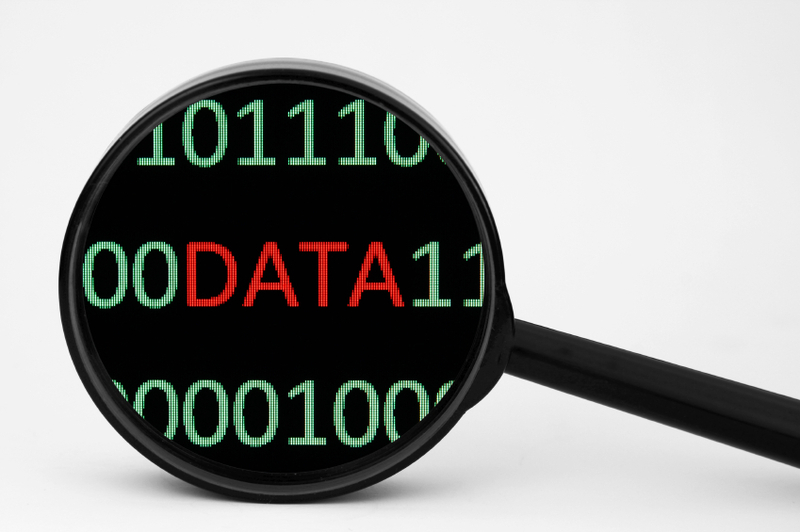 Obviously profiling that data to discern its quality and suitability for the end user is important – however one needs to know where the data is first. An Enterprise Data Model could potentially fulfil this need as long as it contains accurate up to date information about the data sources although these are rare and not easy to build and maintain, especially if the sources include large strategic COTS packages. Whether as part of an Enterprise Data Model or not, understanding the metadata of many of these packaged systems often presents a significant challenge even for seasoned application specialists. They, the COTS packages, were simply not developed with this type of activity in mind so when a data warehouse team is faced with trying to find data in packaged systems from vendors such as SAP and Oracle they regularly experience delays and rework. This is because the data models for these systems are so big, complex and opaque that navigating around them find to the right tables is difficult and time-consuming and, in the absence of tools from ERP and IM vendors, has traditionally been a manual or at best partially automated task. As an example, in an SAP system they would encounter a data model which typically runs to over 90,000 tables and has been customised. In itself that might not be a problem if the System Catalogue held the logical names and descriptions and also the relationships between tables – but it doesn’t so looking there or trying to reverse engineer that information is of little or no help. Trying to figure out, for example, the meaning of a table called T077D, which includes columns FAUSV and FAUSF, and how it is joined to other tables could be a bit tricky and take a long time. I would suggest that this approach cannot possibly support an Agile method. An alternative to the manual method is to use a metadata discovery tool which automates the process of reverse engineering the metadata, including logical names, customisations, relationships, views etc from the application’s Data Dictionary tables in a matter of minutes or hours. This will then give the data warehouse designers, architects and modellers an interface into that information so that they can find and use the tables they need quickly and easily even after additional requirements are identified or rework needed and would enable an Agile approach for the whole project life-cycle. By the way, in case you were wondering T077D is the Customer Account Groups table in SAP. Two of its columns are FAUSV (Sales Data) and FAUSF (Company Code Data). The table has 30 Child Tables (in our system only 17 of which contain data) and 2 Parent Tables. 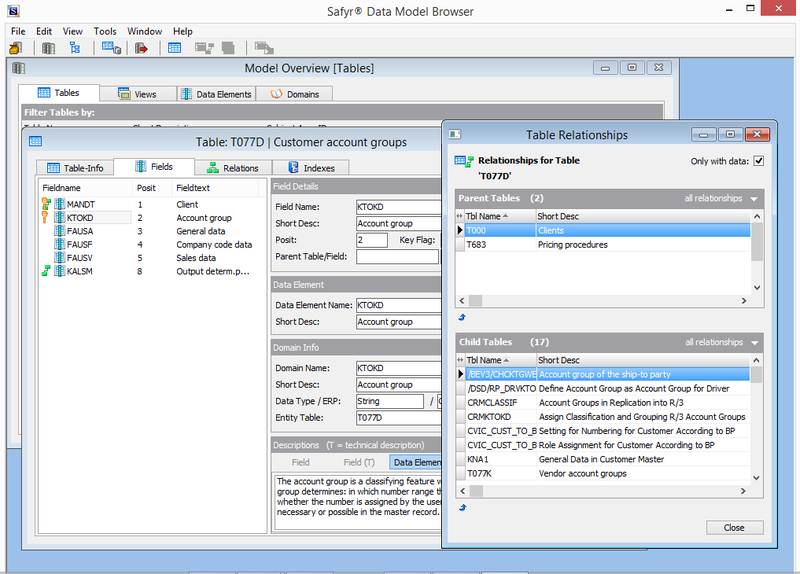 This is the third in a series of data models drawn from the various ERP and CRM systems for which Safyr delivers rapid, accurate and usable metadata. Previously on this blog we’ve produced a Bill of Materials model from a SAP system and an Accounts Payable model from a JDEdwards EnterpriseOne 9.1 system. 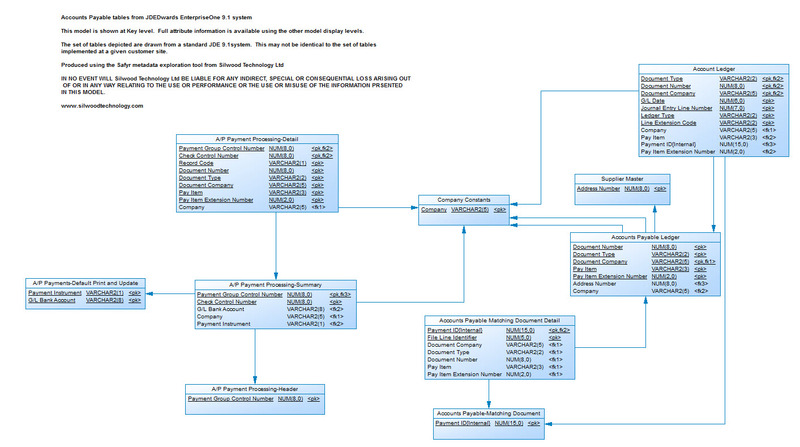 SAP BW InfoCubes are complex and often difficult to understand at the data model level without specialist knowledge. This model is a bit different – it’s a Cube from a SAP BW system. In the terminology of SAP it’s an InfoCube, and this one is the ‘Demo’ cube that comes pre-packaged with the SAP BW system, and as its name implies, is for demonstration purposes. 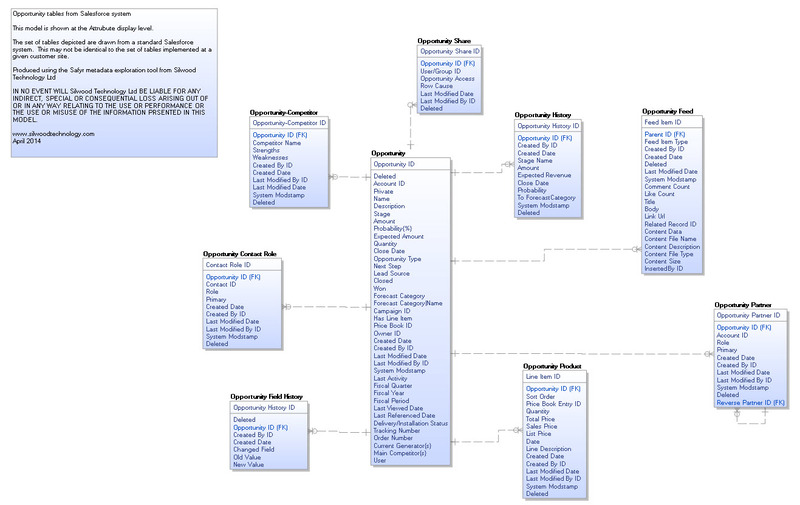 Finding the data model behind an SAP BW InfoCube is often seen as a challenge if you are not familiar with the structure. The model was constructed by reverse engineering a BW system into Safyr, and then choosing the Demo cube as the basis for making a model. Safyr for BW makes it easy to select all the relevant ‘component’ tables of a Cube to be included in the model. The whole process of choosing a Cube and exporting to our own ER diagrammer visualisation tool or to a modelling environment takes about 5 minutes. It’s available below in PowerDesigner and ERwin formats. I can make it available in other formats for anyone that doesn’t have these tools – just drop me a message via the comments box stating your desired format and I’ll see what I can do. Here is the legal bit. In no event will Silwood Technology Ltd be liable for any indirect, special or consequential loss arising out of or in any way relating to the use or performance or the use or misuse of the information presented in this model. I hope they are useful, please let me know what you think. Applications, applications everywhere? And never the data to find? We’ve been providing a solution to get metadata out of ERP and CRM applications for quite a few years now and a common question over that period has been some variation of: “It’s great what you do for SAP (PeopleSoft, Siebel, etc…) – now tell me, can you do the same for our other packaged apps?” And we’ve normally had to say “Sorry, afraid not”. But as of late, that’s all changed. That which we do for SAP, SAP BW, PeopleSoft, Siebel, JDEdwards, Oracle eBusiness Suite and more latterly, Salesforce, is to get at the metadata embedded within these applications by looking at their data dictionary tables. If we simply looked at the database system catalog, then we could claim to ‘reverse engineer’ anything – but that would not normally address the customers’ requirements to really understand the metadata. The key is to provide access to the proprietary data dictionary structures that describe the data underlying the application in a way intelligible to mortals. And that’s why we historically said ‘No’ to the above question. For each application we address, we’ve had to go through a research phase to locate the relevant data dictionary tables and then work out how to extract that metadata and map it into our own repository. So we started to think about how we could address the ‘other packaged applications’ requests. What we’ve come up with is a means to address other applications with the minimum of work. We describe this as ‘ETL for Metadata’ because that’s pretty much what it is ; We can now Extract from a package, Transform the metadata as required and Load it into our Repository, so the searching and manipulation features of Safyr are available, just like for the other apps we already address. The package needs to have a ‘data dictionary’ layer. It might not be called that by the package, but most packages will have their own data definition features for laying a ‘logical’ view over the physical data structure. If no such thing exists, we probably can’t add much value. The data dictionary needs to reside in a relational database. This requirement is not totally cast in stone, but it will make the job a lot easier if we can use SQL to interrogate the data dictionary. Given the package meets these criteria, what’s involved in getting metadata into Safyr? Firstly, we need to do some investigative work to locate where each of the ‘objects’ we store in our repository is located in the application. So we need to find where it stores Tables, where it stores Fields (or Columns), where it stores Relationship information, and so on. Once that research work is done, there is a simple scripting capability within Safyr to allow definition of the queries that will be used to get at this metadata layer. And the scripting capability also includes the ‘Transform’ capability to allow the raw extracted metadata to be manipulated into a suitable form for loading into Safyr. We’ve already used this new capability on a few packaged applications, and the average time from doing the research to delivering the metadata in Safyr is about 5 person/days. Once the scripts to do this have been developed, the extraction process is entirely automatic, just like the extractor functions we use for our longer-established applications like SAP. Over the coming months and years we will be building up a library of such scripts that we can offer to customers who use these applications. We are also always delighted to explore potential applications and markets with partners, domain specialists and other software application vendors. Please let us know if you are interested in a dialogue. We’re going to be adding Salesforce capability to our Safyr product in the next release (due June 2014) so I wanted to give a taste of what this will deliver. Salesforce is much smaller than SAP or the Oracle apps in terms of the number of tables, but can still be challenging to understand from a data modelling perspective. And Safyr’s comparison features are a real help when a customer has multiple Salesforce instances and want to identify the differences. 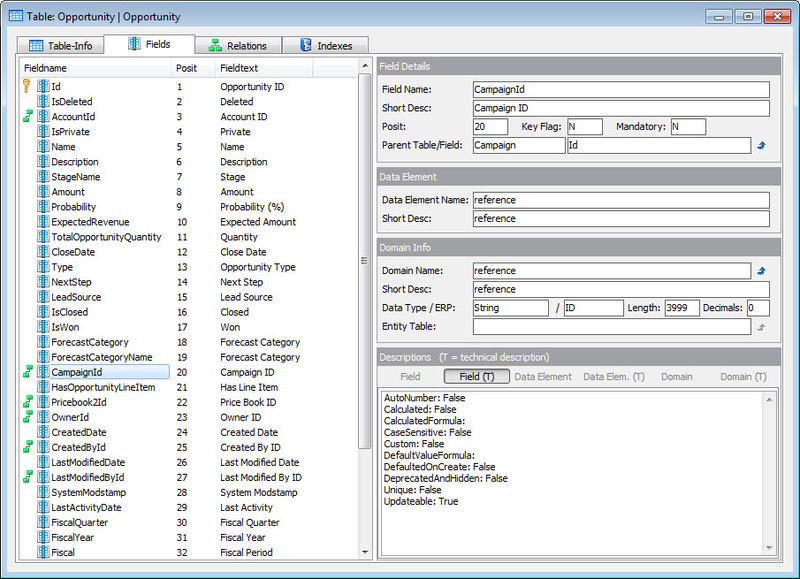 As a preview, I’ve attached models of a set of tables from a Salesforce system showing the ‘Opportunity’ tables. The models were created following some simple analysis in Safyr and then exported. They are available below in PowerDesigner and ERwin formats. I can make it available in other formats for anyone that doesn’t have these tools – just drop me a message via the comments box stating your desired format and I’ll see what I can do. As we are providing something which is usable in some contexts… here is the legal bit. In no event will Silwood Technology Ltd be liable for any indirect, special or consequential loss arising out of or in any way relating to the use or performance or the use or misuse of the information presented in this model. 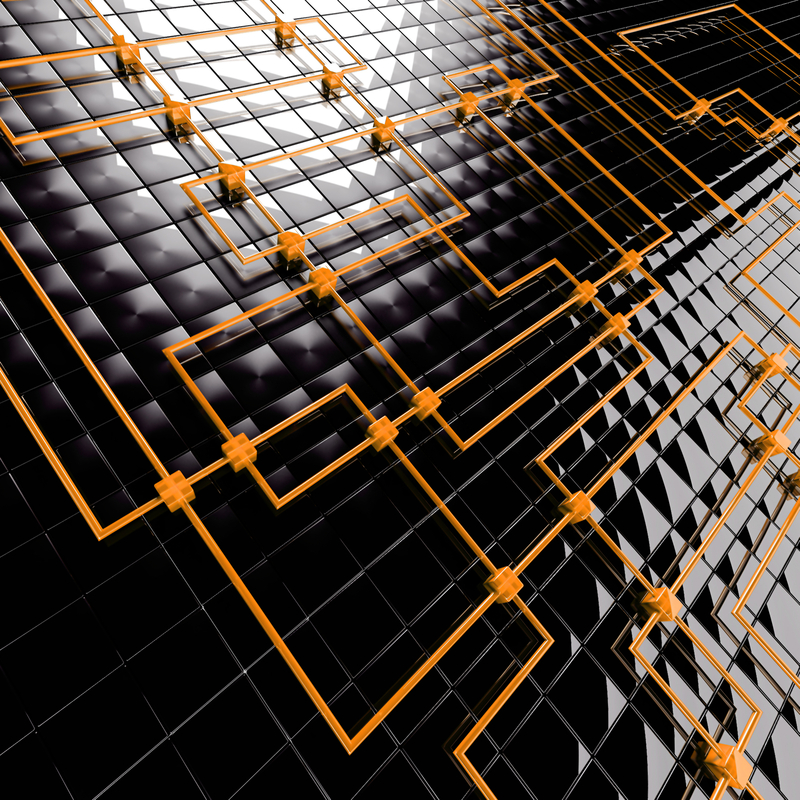 Are complex ERP data models holding organisations back or helping them move forward? According to a recent report by leading analyst firm Gartner, heavily customised ERP (Enterprise Resource Planning) systems will have achieved the status of ‘legacy ERP,’ by 2016. In addition they suggest that as more agile, flexible competitors enter the market and mature, CIO’s will need to plan on what to do with their ‘legacy ERPs’. How easy is to find ERP data structures? The customisation of large Enterprise systems takes place on two levels: business process and data. The changes are delivered in response to a need for additional flexibility and to meet specific business needs which are not catered for in the standard application functionality. Even the Enterprise applications from SAP and Oracle which are large and complex enough in their native state have, in many implementations, had a significant amount of customisation visited upon them. Bearing in mind Gartner’s definition of ‘legacy’, I think that it is quite possible that ERP systems have already attained ‘legacy’ status in terms of data. By this I do not mean the data contained in the applications, I am referring to the way the data is structured in the underlying application data models and the ease, or difficulty, with which it can be understood in the context of supporting projects to meet new business needs. What prompts me to come to that conclusion is that as customers become increasingly keen to leverage their investment in those systems to meet changing business imperatives they are encountering significant challenges in achieving this because of the complexity of the source data, the sheer numbers of tables involved and the level of customisation of those data structures. These problems occur when trying to integrate ERP’s with new applications, extract data from them for BigData, Datawarehouse, Business Intelligence and Analytics projects or incorporate the information they hold in Master Data or other Information Management programmes. The challenge these organisations face is that the underlying data models which are the foundations of these applications are incredibly complex and were not designed with the outside world in mind and there are no vendor supplied tools which allow easy access to them available for people who are not dedicated application specialists. See this Bloor Research report for more information. Even the Information Management vendors only provide a partial solution which relies on a significant amount of application knowledge. To give you some context in terms of the size of data models involved (before customisations): JD Edwards EnterpriseOne comes with about 4000 tables, Siebel with about the same, PeopleSoft and Oracle eBusiness Suite have around 20,000 each, . SAP’s current release of Business Suite has approximately 90,000 tables before any are added. We, at Silwood Technology are aware of one of our customers whose SAP system has 117,000 tables and are sure that many are even bigger! In addition there are added levels of complexity to overcome when trying to find what you need for your projects because of the naming conventions and the relationships between tables. Also this information is not accessible from the data dictionaries of these products, it can only be found in their System Catalogues which presents another hurdle when trying to understand how the data models are architected. 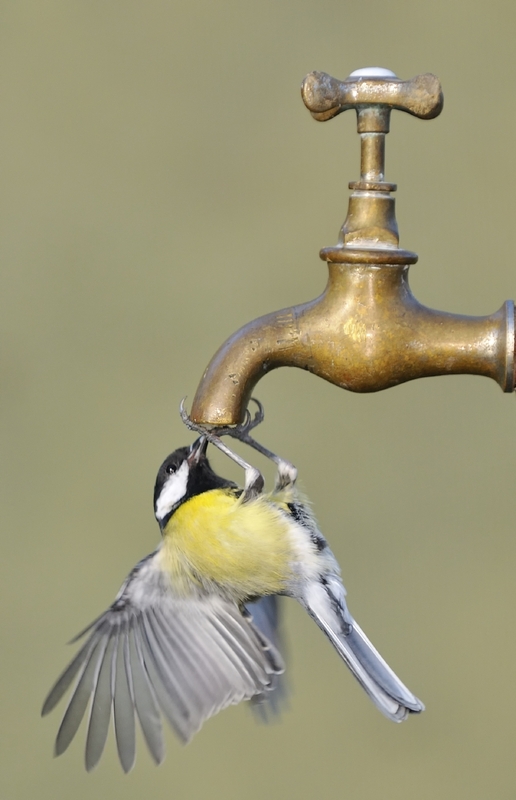 Struggling to find the right data can lead to delays to project delivery and overspend or even the wrong data being introduced into the Enterprise data stream which can significantly impact the performance of the business and damage the reputation of IT within the organisation. By contrast Microsoft Dynamics and Salesforce both have under 300 tables, which is still a significant number, but an easier challenge for data architects and analysts to solve in the context of Information Management projects. We suspect that the trend will be towards applications, whether cloud or on premise based, which are more tightly focused on meeting a specific business need with less complex data structures which are easier to understand and integrate with other applications and into the data ecosystem of an enterprise. I believe that this is equally important for data as business process. Perhaps it is time to start acknowledging the challenge of source data analysis? I know, I know I have got that the wrong way round. Well, actually I did it on purpose to illustrate a problem with BI/Data Warehousing projects and incidentally many other Information Management initiatives. I recently read a very interesting and clear blog by Boris Evelson of Forrester on what factors to consider when deploying a business intelligence platform and how “Initial business intelligence (BI) deployment efforts are often difficult to predict and may dwarf the investment you made in BI platform software.” The link is here. Obviously there is a huge variability in both the cost and the amount of resources required to deliver a successful outcome and this in turn will depend on a large number of parameters all of which are described really well in the blog. My purpose in this piece is not to rewrite Mr Evelson’s excellent document but to focus on a specific area which he refers to as “Source applications integration” and which I believe is often overlooked or ignored until it becomes critical and can then impact significantly on the overall cost and success of a BI project. Struggling to find the right data quickly, especially in complex application systems can delay implementation of Datwarehouse and Business Intelligence projects and lead to inaccurate information being delivered. The problem of course is that unless we can be absolutely confident that we have found the right elements of the source system with which to populate the data warehouse we cannot be confident that the business is using the right information on which to base its decisions. Herein lays my “garbage out, garbage in” thought because no matter how clever your ETL tools are or how good your data quality tool is, if you are working with the wrong files or tables or an incomplete set of tables then the data you extract from the source will be of very little use to the data warehouse or BI users who might make ill-advised decisions based on incorrect data. A secondary challenge is the level of the quality of that data, but it is more important to identify the appropriate sources first. In most instances it is true of course that the source applications are relatively easy to understand. They are straightforward to reverse engineer or have good documentation, or tools exist which assist the process of identifying the tables and columns for use in the DW/BI implementation and often they present no real problem to the project teams. Others however, including those from SAP and Oracle (eBusiness Suite, JD Edwards, Siebel, PeopleSoft) which are the main systems of record for hundreds of thousands of organisations, are much more complex and require much more effort to find the tables needed. Part of the problems lie with the sheer scale of these applications, they all have many thousands of tables (SAP systems for example will have over 90,000 before customisations are applied) and a myriad network of inter-relationships meaning that traditional reverse engineering by modelling tools is either impossible or totally impractical. Imagine having a visualisation of a complete SAP system on a single screen. One of our customers called it a ‘death star visualisation’. It would also be impossible to navigate and search. Additionally there are the sometimes idiosyncratic naming conventions and most implementations have been quite heavily customised meaning that it can be a challenge that even specialists will struggle with to find what they need quickly and easily. Finally the information about tables (metadata) in these applications, and others like them is stored in data dictionary tables rather than the system catalogue. 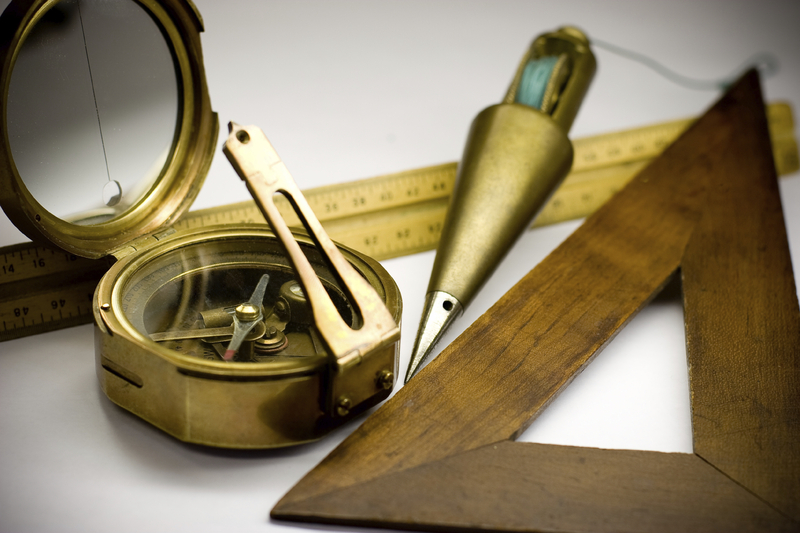 This reduces further the effectiveness of traditional tools which are designed to help you find the right tables and can significantly extend the time it takes to locate exactly what you are looking for and a distinct possibility that a good deal of ‘informed guesswork’ will be involved. So coming back to ‘garbage out, garbage in’; without accurate knowledge about which tables hold the required information in the source systems, the mapping between source and target Datawarehouse via ETL or DI will be less likely to meet business requirements. This will potentially lead to overspend, re-work, lengthening delivery times and at worst risking ill-informed decisions being based on wrong information. Perhaps it is time to start taking the challenge of source data analysis, or ‘metadata discovery’ as we sometimes call it, more seriously before embarking on Data warehouse or Business Intelligence projects?